A "rogue" fish has been removed from a lake after children reported seeing it eating ducks. 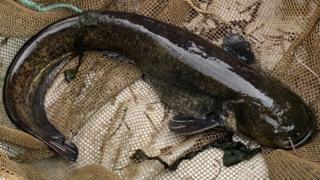 The 25lb (11.3kg) catfish was caught at the man-made lake at the Lakeside shopping centre in Thurrock, Essex, by the Environment Agency (EA). A spokesman said fishing contests would be held at the lake to reduce the population of invasive species. Officer Ben Norrington said: "Large fish have the potential to eat wildfowl so we're pleased we could remove it." The EA said the animal had been seen eating ducks and other wildfowl. "Invasive species pose a serious threat to our native wildlife," Mr Norrington added. The catfish has been relocated to a fully enclosed lake with help from the Catfish Conservation Group.